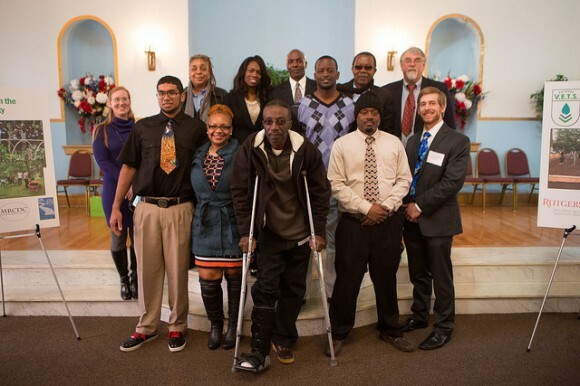 Share the post "Rutgers VETS Program Graduates Inaugural Class"
It was a proud moment at the Willing Heart Community Care Center in Newark, NJ, on March 3, where 12 local veterans graduated as the inaugural class of the Rutgers Veterans Environmental Technology and Solutions (VETS) program. Each of the veterans had stories to share of struggle after returning from service, with limited opportunities to earn a living. When some entered the program last May, they were unemployed and had nowhere else to turn. On February 28, it was a time for celebration. Five of the graduates announced they were teaming up to start their own landscaping business. Others talked about returning to school to take classes in landscaping, horticulture and other specialties focusing on the training they received in the program. One even mentioned she applied to Columbia University to seek her degree. 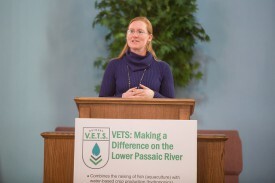 The Rutgers VETS program was launched in May 2014; a unique collaboration among Rutgers University, the Metropolitan Baptist Church Development Corporation and the Lower Passaic River Cooperating Parties Group (CPG), comprising 60 companies working to improve the condition of the Lower Passaic River. Each member of this partnership was integral in launching a project that is likely the first of its kind in the country. The program was prompted by a concern about human health risk to those who eat contaminated fish from the river while a long-term remediation plan is decided for the river. The veterans helped set up equipment in a newly constructed greenhouse in Newark that will be used to raise fish and grow vegetables. The Rutgers VETS participants will raise healthy fish to exchange with contaminated fish that some anglers are taking from the river as food. There is also a hydroponics component, in which water from the fish tanks would be used to provide nutrients (nitrogen) to grow vegetables. Vegetables would be donated to an on-site food pantry the church operates. This class of veterans helped set up equipment in a newly-constructed greenhouse on Dr. Martin Luther King, Jr. Blvd. in Newark that will be used to grow fish and vegetables, while creating community gardens around Newark. There was also plenty of classroom instruction, with Rutgers bringing in experts in horticulture, landscaping, and stormwater management, as well as trips to successful urban farms. The next class of veterans, to be recruited for the spring, would raise fish in the greenhouse and bring these clean fish to the river, and exchange them with the anglers catching contaminated fish, mostly carp and catfish. Such a program would immediately reduce human health risk while a long-term remediation plan is decided for the river. Issac Ezirim, a Rutgers VETS graduate who lost many of his possessions in Superstorm Sandy and will soon be moving to his new home through Habitat for Humanity Newark, said the program has changed lives. Amy Rowe addresses the veterans, families and dignitaries that attended the graduation. “This is truly a special group of people, and it was a pleasure and an honor to coordinate this job training program,” said Amy Rowe, of the Rutgers Cooperative Extension of Essex County, which recruited the veterans and ran the program. Rowe and her fellow environmental resource management agent, Jan Zientek from Rutgers Cooperative Extension of Essex County, direct the training part of the program. 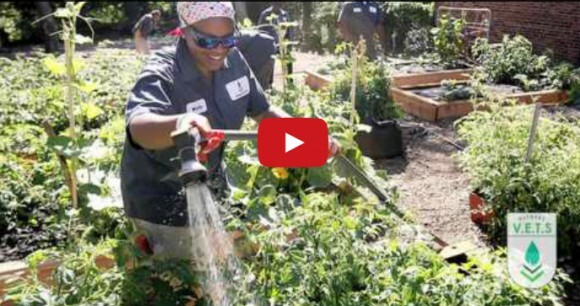 By the end of 2014, the veterans underwent more than 900 hours of training in the areas of sustainable landscaping, stormwater management and aquaponics. 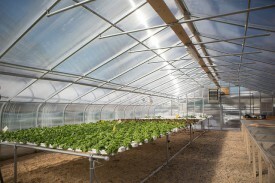 The focus combined the raising of fish (aquaculture) with water-based crop production (hydroponics). 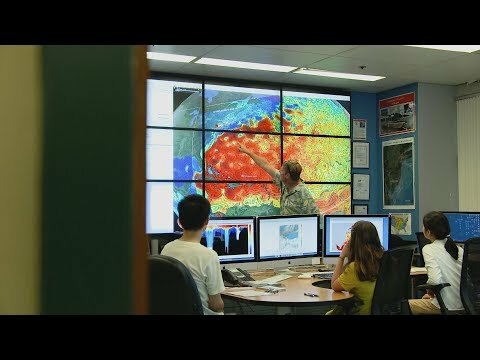 The Rutgers VETS program is seeking funding to support the program moving forward. For more information, contact Amy Rowe of Rutgers Cooperative Extension, at rowe@njaes.rutgers.edu or at 908-235-1168.